Roma music of the Balkans. Saxophone, bass, drums. Gajda and zurna. Dances from Greece, Macedonia and their neighbours. Rob and Anne are now full time repairing brass and woodwind instruments, so if you need your trumpet unbent or sax repadded call us! Tutti Frutti and Gazi's CD reviewed in fRoots magazine!!! "...a triumph. This is quite splendid, energetic and powerful, and a credit to both the musicians and their collaborators and informants. More, please!" 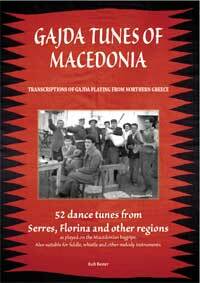 "Florinalia" CD of dance tunes from Florina in Northern Greece. Featuring Will Eager and Michael Rogers from 'Doch' on drum on trumpet. This page has a counter!